Beautiful traditional rice basket, very large. Lacquered for waterproofing and hand painted. 24" tall x 18" wide with 10" top opening. Used in the movie Pirates of the Caribbean II. 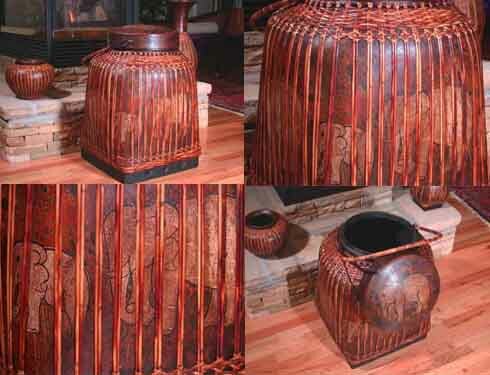 Made of lacquered basketry to make it waterproof and also deter insect pests, this seed container is also decorated with a stylized motif and an outside frame of bamboo slivers. It is used in Northern Thailand for storing seeds that will be sown during the next planting season. These baskets are basically utilitarian, at the same time however, they display an undeniable elegance of form and delicacy of workmanship that raises them to the level of genuine folk art. This basket is 24 tall and 18 wide with a 10 opening at the top.